New Pedego Store Brings “Magic Carpet Ride” to Aiken, S.C.
FOUNTAIN VALLEY, Calif., April 16, 2018 — A new Pedego® Electric Bikes store is now open at The Village in Woodside in Aiken, S.C. A second location, a manned Pedego rental kiosk, is located in “The Alley,” Aiken’s downtown historic district. 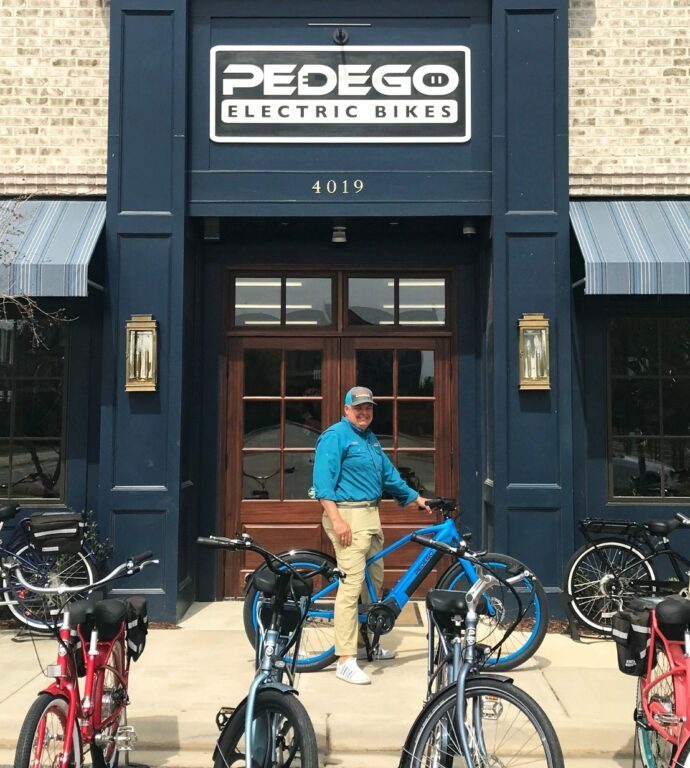 Pedego Aiken owner Coker Day is delighted to open the first Pedego electric bike stores in Southeastern South Carolina, bringing the nation’s Number 1 electric bike brand to the region. He is looking forward to energizing the community with Pedego’s stylish, powerful bikes that flatten hills and make headwinds a breeze. WHERE: 4019 Pavilion Pass, Aiken, S.C.
Tom Bock from Pedego Corp.
Pedego Aiken owner Coker Day shows off his fleet of colorful and powerful electric bikes. Pedego Aiken offers rentals, tours, sales and service of Pedego electric bikes. The Pedego Aiken store is located near many scenic bike paths that take riders to numerous historic and scenic destinations. A manned Pedego rental kiosk is located in Aiken’s downtown historic district. Riders have the option of guided tours or bike rentals, empowering them to discover more than they would have found on foot or by car. Aiken’s South Boundary Avenue has been rated as one of the Top 10 scenic streets in the United States. The equestrian district boasts gorgeous historic mansions that make sightseeing by Pedego a pleasurable experience. A local arboretum trail takes riders along a picturesque path. All of the streets in Aiken are lined with live oaks and southern pine trees. Scenery takes center stage while riders enjoy gliding on their bikes, pedaling or not as they choose. Riders can conquer hills, headwinds and distances with the bike’s PedalAssist and twist-and-go throttle. Pedego Aiken is the region’s premier dealer in Pedego Electric Bikes, offering Pedego electric bikes sales, rentals, tours, accessories and service in two locations. The Pedego Aiken store is located in The Village at Woodside, address: 4019 Pavilion Pass, Aiken, SC, 29803. A manned Pedego rental kiosk is located in “The Alley,” Aiken’s downtown historic district at 132 Laurens Street NW. Pedego Aiken is open Monday through Saturday, 10:00 a.m. to 6:00 p.m. Call (803) 226-9007 to learn more and arrange a free test ride. For more information, email the owner at [email protected]. To learn more, visit https://www.pedegoelectricbikes.com/dealers/aiken/ and follow us on Facebook.